The video below is of the sermon Presiding Bishop-Elect the Rt. Rev. Micheal Curry gave August 17th, 2015, in the courthouse during the 50th Anniversary Commemoration for Jonathan Myrick Daniels–an Episcopal seminarian who was slain in Hayneville, AL on August 20, 1965 while working for civil rights. 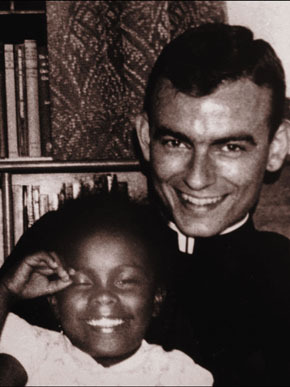 Jonathan Myrick Daniels was an Episcopal seminarian and civil rights activist. In 1965 he was murdered in Hayneville, Alabama while in the act of saving a young woman civil rights activist. They both were working in the Civil Rights Movement in Lowndes County. Daniels’ death generated further support for the Civil Rights Movement. In March 1965, Daniels answered the call of Dr. Martin Luther King, who recruited students and clergy to join the movement in Selma, Alabama, to take part in the march for voting rights from Selma to the state capital of Montgomery. Daniels and several other seminary students left for Alabama on Thursday, intending to stay the weekend. After Daniels and friend Judith Upham missed the bus home, they had second thoughts about their short stay. The two returned to the seminary just long enough to request permission to spend the rest of the semester working in Selma, where they would also study on their own and return at the end of the term to take exams. In Selma Daniels stayed with the Wests, a local African-American family. During the next months, Daniels worked to integrate the local Episcopal church by taking groups of young African Americans to the church. The church members were not welcoming. In May, Daniels returned to the seminary to take his semester exams and passed. Daniels returned to Alabama in July to continue his work. He helped assemble a list of federal, state, and local agencies that could provide assistance for those in need. He also tutored children, helped poor locals apply for aid, and worked to register voters. That summer, on August 2, 1965, Congress passed the Voting Rights Act which would provide broad federal oversight and enforcement of the constitutional right. On August 14, 1965, Daniels was one of a group of 29 protesters, including members of the Student Nonviolent Coordinating Committee (SNCC), who went to Fort Deposit, Alabama to picket its whites-only stores. All of the protesters were arrested and taken to jail in the nearby town of Hayneville. The police released five juvenile protesters the next day. The rest of the group was held for six days; they refused to accept bail unless everyone was bailed. Finally, on August 20, the prisoners were released without transport back to Fort Deposit. After release, the group waited near the courthouse jail while one of their members called for transport. Daniels with three others—a white Catholic priest and two black female activists—walked to buy a cold soft drink at nearby Varner’s Cash Store, one of the few local places to serve non-whites. But barring the front was Tom L. Coleman, an unpaid special deputy who was holding a shotgun and had a pistol in a holster. Coleman threatened the group and leveled his gun at seventeen-year-old Ruby Sales. Daniels pushed Sales down and caught the full blast of the shotgun. He was instantly killed. Father Richard F. Morrisroe grabbed activist Joyce Bailey and ran with her. Coleman shot Morrisroe, severely wounding him in the lower back, and then stopped firing. A grand jury indicted Coleman for manslaughter. Richmond Flowers, Sr., the Attorney General of Alabama, believed the charge should have been murder and intervened in the prosecution, but was thwarted by the trial judge. Coleman claimed self-defense and was acquitted of manslaughter charges by an all-white jury. The murder of an educated, white seminarian who was defending an unarmed teenage girl shocked members of the Episcopal Church and other whites into facing the reality of racial inequality in the South. Other members worked to continue the civil rights movement and work for social justice. Upon learning of Daniels’ murder, Martin Luther King, Jr. stated that “one of the most heroic Christian deeds of which I have heard in my entire ministry was performed by Jonathan Daniels”. In 1991 Daniels was designated as a martyr in the Episcopal church, and is recognized annually. Ruby Sales went on to attend Episcopal Theological School (now Episcopal Divinity School). She works as a human rights advocate in Washington, D.C. and founded an inner-city mission dedicated to Daniels. This entry was posted in Events and tagged Civil Rights, Jonathan Myrick Daniels, Martyr, Michael Curry, Selma, seminarian. Bookmark the permalink.